Heavy snowfall is expected in many parts of the UK, with south-east England expected to be worst affected. The Met Office issued severe weather warnings for very heavy snowfall in London, south-east and east England and said travel networks may be affected. Up to 20cm of snow may fall in Kent, Sussex, Surrey, London and East Anglia, with gale-force winds causing drifts. 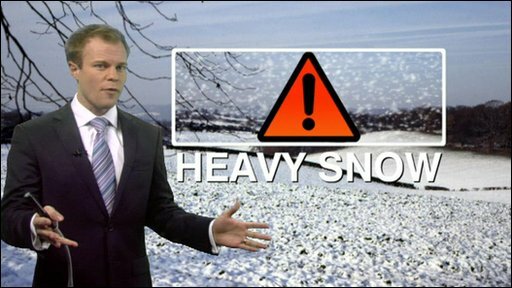 And severe warnings for heavy snow were issued for Yorkshire and Humber, the East Midlands and north-east England. Snow is also forecast in parts of central and northern England, Northern Ireland, Scotland and Wales. There have already been intermittent snow showers leaving a covering of snow across north-east England, parts of East Anglia and the Midlands. Snow has also been falling in the Brecon area of mid Wales and in the Neath area of south Wales. The snowfall is expected to become heavier later with bands of snow spreading across south-east England, East Anglia and the London area. About 10cm of snow fell on Thursday night in parts of East Anglia, which made driving treacherous. John Hammond, of the BBC Weather Centre, said conditions would worsen through the early hours of Friday, with gale-force winds causing snow to drift, and some places seeing as much as 20cm of snow. Conditions are expected to be at their worst during the Friday morning rush hour. Conditions in the South East are expected to ease during Friday, with more cold and icy weather predicted for Saturday and Sunday. Further snow is predicted over the weekend, particularly across the north of the UK. However, the Met Office said it was too early to say whether there would be a white Christmas. A Met Office spokesman said: "Current indications show an ongoing battle between the colder air currently over the UK and milder air pushing in from the west. As a result the forecast for Christmas Day is still too close to call." The Highways Agency said it had 94 winter maintenance compounds across England, with 25 in the South East, and was able to treat all roads within three hours of severe forecasts. A spokesman told the BBC: "The snowfall in February  was the worst the UK has seen for at least 18 years and was a tough test of our winter preparations. "The Highways Agency was well prepared for the severe weather and working with central government, was able to help a number of local highway authorities experiencing difficulties with shortfalls in their salt levels." He said road users had to "play their part" and "drive appropriately". "We are asking drivers to carry out simple vehicle checks before they set out; to carry a severe weather emergency kit in their vehicles and to monitor the traffic and weather conditions," he said. But earlier this week, the AA motoring organisation said half of the UK's local authorities only had enough road salt for six days of continuous freezing. It said councils had 250,000 tonnes less salt than a decade ago - a claim dismissed as "scaremongering" by the Local Government Association. The Highways Agency has advised drivers to carry out simple vehicle checks before setting out, to carry a severe weather emergency kit in their vehicles, and to monitor the traffic and weather conditions. Forecasters have already warned of very cold weather this week, with temperatures falling as low as minus four. The Department of Health has urged older people, families with young children and people with disabilities or long-term health conditions to take extra precautions to keep warm and well during the cold weather.